Major changes are taking place to the landscape around the Technology Building (TB) at the Taylorsville Redwood Campus. 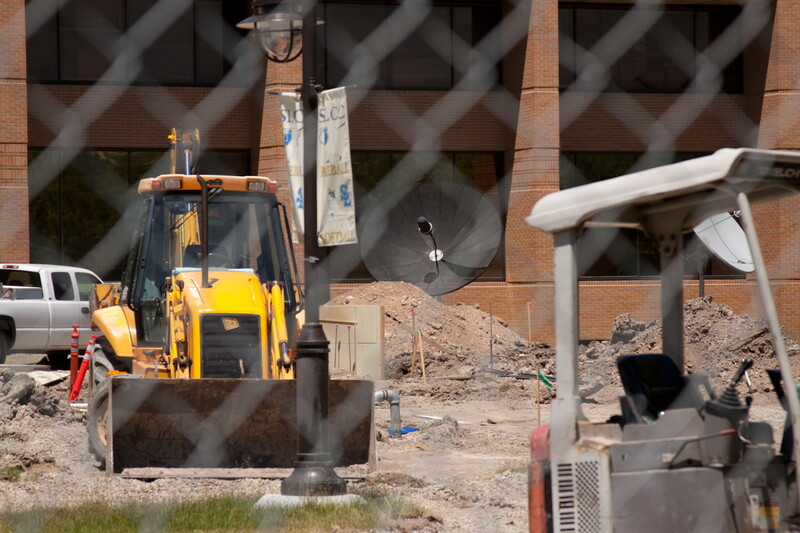 The construction is phase two of the Legacy Fountain Project. Legacy Fountain is the name of the fountain on the campus. It is called this due to the bricks that have people’s names engraved on them. These names belong to people who have donated money for fundraising. A private contractor by the name of MSCI is working on phase two. When construction is complete there will be a section opened for donated trees. The college will be accepting donated trees in the same manner as the donated bricks. In this section there will also be a number of sitting walls, with metal benches also being accepted in the same way. With the new landscaping, the sidewalk on the south side of the TB building will be shifted to the north, closer to the building. South of the sidewalk and east of the fountain is where the donated tree section will be located. There will not be a change to the south side building entrance, but there will be a new entrance approach with stairs, and a new ADA (Americans with Disabilities Act) specifications wheelchair ramp. Due to the construction on the south side, the entrance and the ramp, plus the sidewalk, are all closed at this time. For some students the construction outside does have an effect on them. “It would be nicer if they could be done sooner. I walk from the AD (Administration Building) building over here (TB building). It would be nice to be able to use the south entrance,” student Jeremy Willey said. Some other students are not bothered by the construction, and the entrance being closed. “Most of my classes are here, (TB building), so it doesn’t affect me,” Jesse Valdez, communication student said. “We’re hoping to be done by mid August,” Baker said. This would be just in time for the beginning of classes for fall semester. There will be a third phase to this project. There will be more landscaping done on the west side of the quad, which is the square that the Student Center, TB Building, AD Building, and Construction Trades Building make up. This landscaping will also follow with the Legacy Fountain design. Phase three will be done if the facilities services receives funding to continue with the project. Individuals interested in making donations can contact the marketing department for more information. Information can also be found on the college’s website, www.slcc.edu.